Today you were wake up little late in the morning and don’t have enough time to cook something for you and your family? So, here it come quick and easy breakfast recipe “Bread Upma” that will also change the taste buds from the bored bread sandwich. 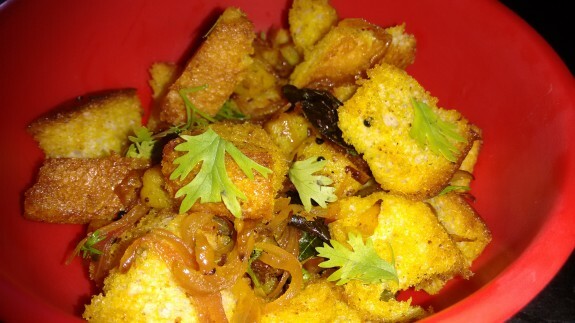 How to Make Bread Upma ? 1. Cut the crust of the bread from the side. Now cut the breads into cubes. 2. Heat oil in a pan and add the mustard seeds. 3. When the mustard seeds start cracking, add lemon leaves and diced potatoes. Fry the potatoes for few minutes until it becomes soft. You can fry the potatoes at the beginning and keep it aside. 4. Now add chopped onions and sauté them in medium heat until onions turns into brown. 5. Add turmeric powder and tomatoes. Fry it for 3-4 minutes until tomatoes soften. 6. Now, add lime juice, salt, bread cubes and stir gently until everything mix properly and the bread cubes turned into yellow. Now add chopped coriander leaves and mix well. 7. Remove the dish from the flame and serve it hot.